Hand Eczema is also known as Hand Dermatitis. It describes any type of eczema that affects your hands. The symptoms of hand eczema can be irritating and painful. You can get hand eczema on any part of your hand, although it is more common on parts that bend. These include down the sides of the hands, the knuckles and the wrist. This is because eczematous skin is less flexible and supple, so each time you use your hands the skin can break more. This is when cracks in your skin appear, becoming more irritated and itchy. Hand eczema tends to be triggered by an irritant or an allergen. 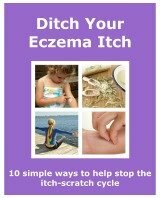 You can read more about some of the more common triggers of eczema. It can also be when you are more prone to eczema. You could either have a history of atopic dermatitis, or the other atopic diseases, asthma and hay fever. It can also occur in someone who works in an irritating environment, or if they are in regular contact with a substance that is an irritant or allergen. This type of eczema is also known as Occupational Eczema. It can happen in any occupation, but working in certain jobs can put you at more of a risk than in others. Water is also one of the main culprits. If in your job or your daily life you have regular contact with water, you are also at risk. Ironically, water can dry out your skin. Whenever you have had your hands in water, it is important to moisturise them thoroughly afterwards. When your hand eczema is mild you can treat it very simply. The most simple thing you can do is moisturise. There are so many things that can dry the skin out, including water, wind, air conditioning and central heating. Some things you can avoid. Others are harder to avoid. The best way to combat the effects that they can have on your eczema is to moisturise your skin. It helps to build a protective layer on your skin which can reduce any skin damage. Moisturiser also helps to improve the dryness of the skin. This helps to make the skin more supple, preventing cracks to appear. When your eczema becomes inflamed and sore, you can use a topical corticosteroid. You can use one to reduce the redness and itchiness. When your symptoms have improved you can just use a moisturiser. When symptoms are severe and don’t respond to the first stages of treatment, then your doctor may look at other options. Eczema can be a little harder to treat when an infection occurs. When the skin cracks, bacteria can enter the skin, causing a Staph aureus infection. Your doctor may prescribe you either an oral antibiotic, or a combination cream, containing a steroid and an antibiotic. Patch testing is another option. Allergy testing can help to determine which allergies and irritants make your eczema worse. This will help you to avoid them and protect yourself against them. Phototherapy may also be suggested. Your doctor may recommend you for it if your eczema is chronic and unresponsive to other treatments. There are special light units that are used to treat the hands. Another treatment that may be tried is Toctino, which contains alitretinoin. It is used to treat severe hand eczema by reducing skin inflammation, which reduces itchiness and further skin damage. Avoid wet work as much as you can. After washing your hands, pat them gently with a soft towel, then apply moisturiser. Limit your hand jewellery. Rings trap soap, dirt and other irritants under them, so remove and clean them often. I have had an issue with hand eczema since I was about 16 years old. I had always had eczema on other areas of my body, but it wasn’t until I was 16 that it became severe on my hands. It started when I began a job as a kitchen assistant. I had always wanted to be a cook so it was a great job for me. Well it was for a few weeks, but the heat and the pot washing triggered my symptoms. My hands became red and sore, and extremely itchy. At one point my hands were covered in blue plasters. Needless to say, I had to leave that job. For the next 14 years I had hand eczema in varying severities. Sometimes it was very manageable but other times it was hard to live with. It was at its worse when it became infected. The first time, I didn’t know it was infected until I went to the doctors. It had spread from my hands, all the way up to my elbows. It was very painful. My doctor gave me some oral antibiotics, as it was so widespread. Combining these with topical corticosteroids and moisturisers cleared it up very well. I still have small outbreaks on my hands, which mainly occur in winter. The mixture of the cold weather and central heating can cause allsorts of problems. My skin becomes dry and itchy, cracks appear and if I don't look after my skin and refrain from scratching I find myself in my doctors waiting room needing some antibiotics ! I always use a moisturiser, whatever time of year. I carry some with me everywhere as I'm always applying it. When I get a small outbreak I use a topical corticosteroid. I find that after using one for a couple of days helps to clear up the worse of the inflammation. To help manage my hand eczema I wear latex free gloves to do alot of things, including washing up, hand washing clothes, cooking, especially when chopping onions and garlic, and house cleaning. Housework involves using cleaning products, which may contain irritants, and also dust irritants my skin. 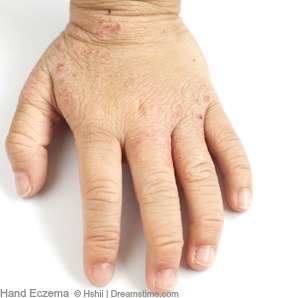 There is a type of eczema that affects the hands. It is known as Dyshidrotic Eczema, or Pompholyx Eczema. You can read more about it here, if you want to find out if you might have this type.